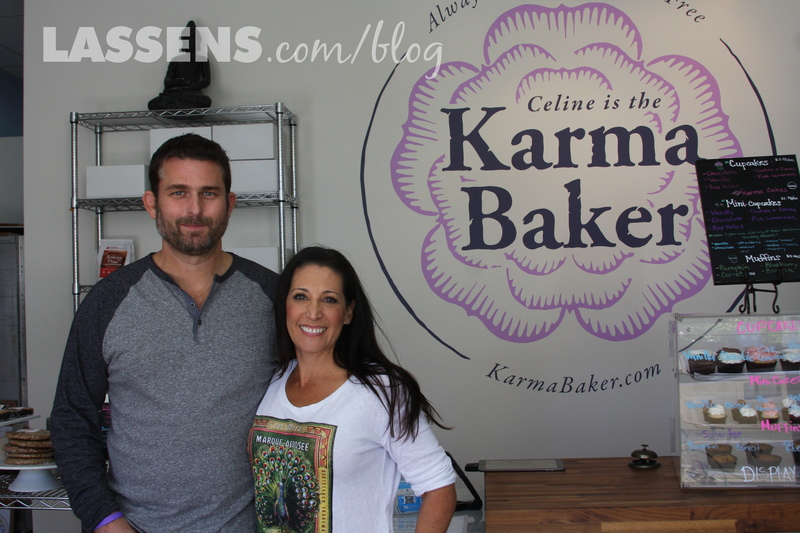 Celine is the (Local) Karma Baker! Celine calls herself a natural baker, and when the daughter of a friend was found to have allergies, she decided to try her hand at baking her some treats. She started experimenting, and the first treat she made was a garbanzo bean brownie, which was a big hit with her friends. Fast forward about 5 years, and Celine found herself in the same allergy boat. She had a persistent runny nose that just couldn’t be explained. She turned to her friend, and after a round of testing, found that she was also allergic to lots of things. So she started to drastically alter what she ate. This of course spurred her on to further experimentation with gluten and allergen-free cooking and baking. 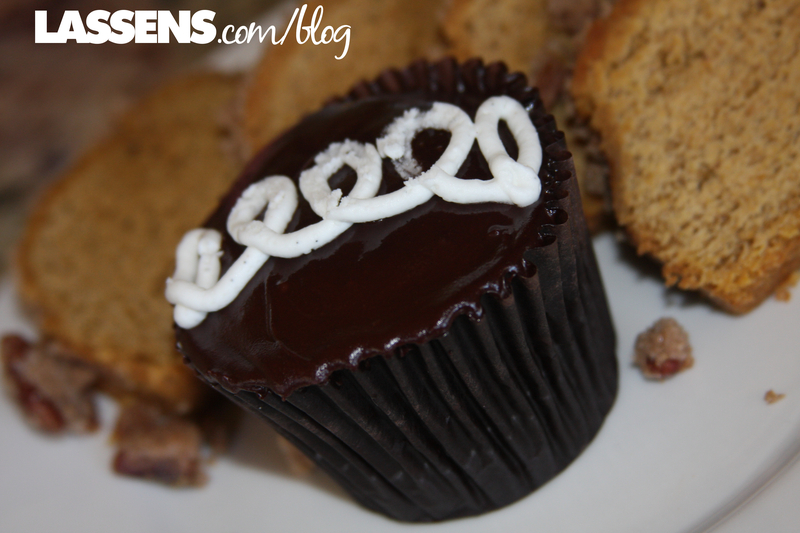 It took her two years to figure out the perfect gluten-free flour, which happens to be vegan! She uses a blend of organic bean, soy, and nut flours. Celine and Arek, her partner, are passionate about not only the health benefits of eating gluten free and vegan, but also the environmental benefits. They said that each of their cupcakes saves something like 250 gallons of water over a regular cupcake, since there are no eggs or dairy products in Celine’s treats. Celine loved to share her treats, and her friends started to encourage her to make her treats available commercially. So she started small by baking for little local cafés and neighborhood grocery stores, as well as at Farmer’s Markets. She quickly outgrew her home kitchen, and two years ago started to bake at a local commercial kitchen. She kept a watchful eye to be sure that there would not be gluten contamination from the other baker in the kitchen. The first item she sold was a pineapple loaf, which is still a favorite! Just because it looks familiar doesn’t mean it’s junk! When the owner of the commercial kitchen needed to move on, Celine didn’t know what to do. She actually needed a larger kitchen so the timing was good, but she had no idea where to go. One day she decided to just stop worrying about it, and to go get her nails done. As she drove through the shopping center, thinking about what to do, she noticed that there was a small café that had closed. She called the realtor, and “like magic,” she had her kitchen, already stocked with ovens and pans and mixers. 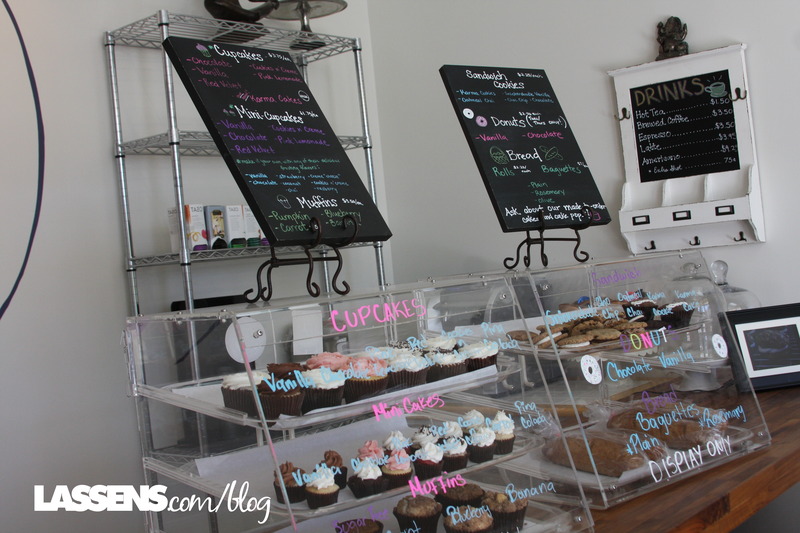 As she turned it into her bakery, people stopped by, asking when they were going to open. A shop was never in Celine’s plan, but when she saw the interest she decided to open the front of the store into a retail space where people could come and order some treats or just grab a quick cookie or muffin. She’s been open in Westlake on Lindero Canyon for about six months. And now Lassen’s is so pleased to offer Celine’s delicious Organic, Gluten free, Vegan treats! Celine and Arek want to not just offer treats for the allergy crowd, but to change minds about the way we eat. They reminded me that there are lots of reasons for eating this way, not just because of allergies. And these delicious treats make eating well a lot more fun! They are so delicious that there is no need to have a separate treat for the “poor kid” with the allergies; everyone will love them! 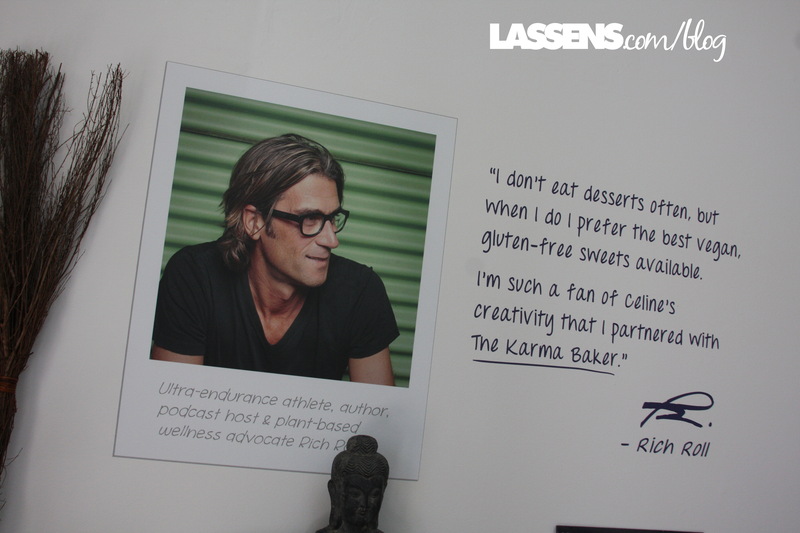 Look for the Karma Baker lotus blossom label at Lassen’s, and try a healthy, gluten free and vegan treat! Thank you for the lovely blog article! We are honored to be a part of the Lassen’s family stores. You truly offer a wonderful thing! A quick side note.. Our Vegan & gluten free flour is FREE of beans , nuts and soy. And VERY allergy friendly. Namaste. Thanks, Celine, for the added info! I really enjoy your Karma Baker treats! Fantastic! 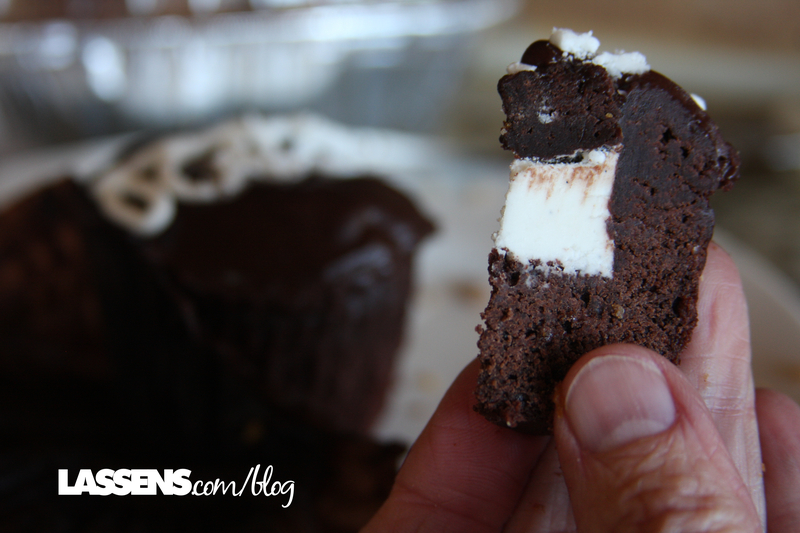 You’ll enjoy these treats! I didn’t see anyone mention you are also a Kosher bakery, important to many of us. So thank you Celine. GF, Vegan AND Kosher is not an easy house to keep! I am so appreciative of your delicious goods. Thanks for your question! I just got off the phone with Arek from Karma Baker, and he assured me that they have KCA Kosher Certification — a Rabbi comes every week to check the kitchen. So yes, they are taking care for all of your needs! Enjoy their delicious treats! Do you do any grain & soy free baked goods? I am not sure if there are any Karma Baker products that are both grain and soy free. I believe that the ones we carry at Lassen’s generally have some soy. However, feel free to come into Lassen’s and our helpful staff can assist you in finding products that fit your needs! Glad to learn about you! You hit the mark for me in 3 areas; organic, gluten free and vegan. I live in Ojai, and so having Lassen’s carry some of your products is helpful, as I don’t get to Westlake very often. I am wondering (and maybe I just missed this in the article), is the soy flour you use non-GMO, and/or organic also? I just spoke with Arek for clarification, and he reminded me that Karma Bakery doesn’t use any soy flour. He also said that all of their flours are organic, and therefore non-GMO. (One of the requirements to be certified organic is to be non-GMO.) So you can enjoy their treats without concern! Thanks for your question! I absolutely Love your VEGAN GF treats, and I just visited your bakery the other weekend for a delicious chocolate sprinkled doughnut! I am allergic to SOY and so are most of my friends. I really wanted to get a white doughnut, but I was told I couldn’t eat the white doughnuts…is there anyway you could experiment and make them without the soy milk? I will pass your request on to Celine at the Karma Baker! Can’t wait to try your GF treats, and GF and sugar free treats! Thanks! It’s fun to have options, and these are delicious! Do we have to order them at Lassen’s or do they have there already? I usually shop at the Oxnard Store and haven’t seen them. Please let me know. Thank you. This may not be an item that is regularly stocked at the Oxnard store. Please speak with the manager and they will special order them for you! 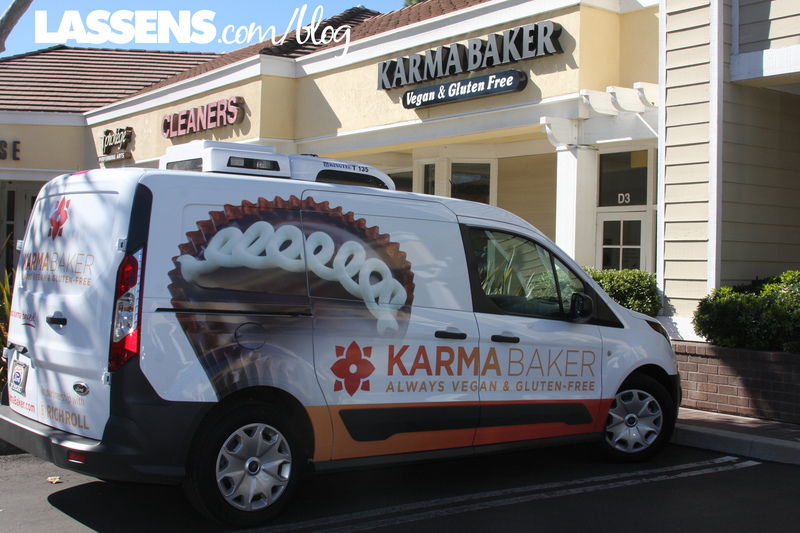 Where is the karma bakery located? The Karma Baker is on Lindero Canyon in Westlake Village. It’s really fun to go into the Bakery! Are any of these treats keto friendly? (Sorry it has taken me so long to get an answer — I’ve been trying!) I spoke with the bakery today, and they said that since these are baked goods, they are not keto friendly. Their focus is Vegan and Gluten-free. Lassen’s has lots of keto friendly products, so come in to any of our stores and our friendly and helpful staff can help you find many items that you’ll love!